Savant is reviewing this one more or less just for the record; it's one of the few discs I've run into lately that I can't recommend at all, mainly because the transfer is Pan-Scan and the color isn't very good either. American International released this big-star Shakespeare adaptation in 1970, and it had a pretty good reputation at the time, even if some of the casting reaches for star names. Julius Caesar (John Gielgud) returns triumphant over the sons of Pompey, and when the crowds cry for him to be made emperor, he turns them down three times. But a group of senators, spurred on by Cassius (Richard Johnson) think Caesar really wants to be dictator and plot to murder him right on the senate floor. Brutus (Jason Robards) is a close friend of Caesar but goes through with the plot, which has to be kept secret from Marc Antony (Charlton Heston), Caesar's boon companion. Hollywood still goes for the Marlon Brando / James Mason Julius Caesar by Joe Mankiewicz in 1953, but there's always room for good work and Stuart Burge's 1970 version isn't bad. A few key Americans play major roles, with Heston getting the "I come to bury Caesar" speech, while Briton Richard Johnson (Khartoum) scoops up quite a few other timeless zingers as Cassius. Jason Robards broods, Robert Vaughn strikes poses, and John Gielgud is his word-perfect self even when being stabbed like a pincushion. Director Stuart Burge worked almost exclusively in TV (Danger Man was an early series of his) except for two or three play adaptations for the big screen. The action is played out in some nice sets, what we can see of them, anyway. Shakespeare devotees and letterboxing foes might find something to like here, but this is not a disc I recommend. 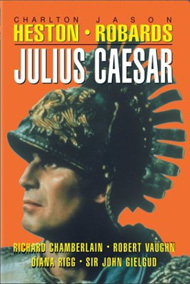 Lion's Gate's DVD of Julius Caesar has to be explained in terms of marketing realities; the chances are the owners of this title added up the numbers and decided that a decent transfer wasn't a profitable idea, when they could just foist this master on the public and move on. During the main credits the show is flat letterboxed in the way that so many 'scope films used to be cheated on VHS and laser. After the director's credit fades the picture zooms in, chopping off big portions of the screen left and right. As the image is often packed with people we often can't tell who's missing and who's not; and with five or six bodies filling every shot the lack of peripheral context keeps us from getting a good look at many of the settings. In other words, it's a prehistoric flat Pan-Scan transfer unwelcome in the enhanced DVD world. The colors are pale and the image grainy, especially the titles that play over Caesar's triumphal parade (it's an optical, of course). Audio is just okay. There are no subtitles, a definite negative for a Shakespeare movie: Illiterates of The Bard (Savant raises his hand) could use them. This title is a case where it will be good to wait for another release, someday. Lion's Gate puts out a lot of good discs - I've already watched twice the terrific Force of Evil from a couple of weeks back - but this is a sad effort.